pends on the notion of density of subset of . tained various results, see for instance . ,:=xy the area of the triangle having vertices 0,,.  if f, g are linearly independent. Then .,. is a 2-norm on Y.
satisfies some property P for “almost all n”. 12000 Mathematics Subject Classification. 46E30, 46E40, 46B20. 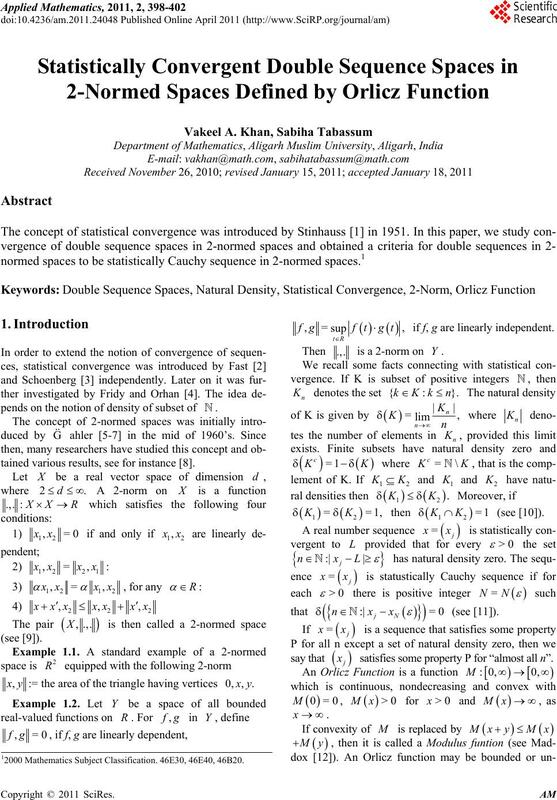 V. A. KHAN ET AL. [18-20], Moricz and Rhoades  and many others. Hence, the right handside of above equality equals 0.
y for almost all n.
Proof. 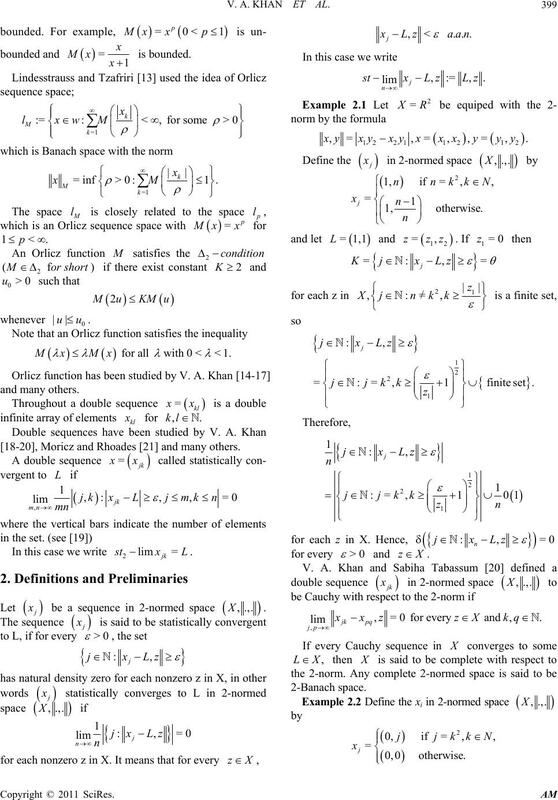 See proof of Theorem 2.9 . No. 1, 1951, pp. 73-74. 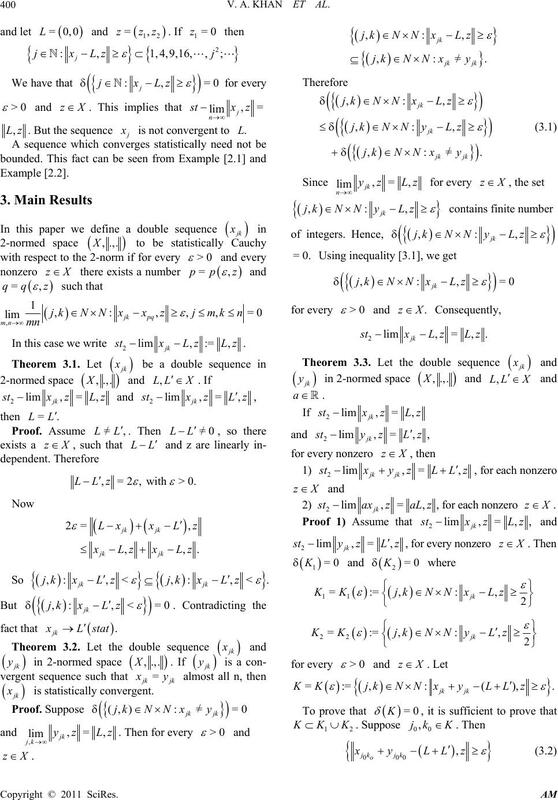 Mathematicum, Vol. 2, No. 1, 1951, pp. 241-244.
tical Monthly, Vol. 66, No. 5, 1959, pp. 361-375.
cal Society, Vol. 125, No. 12, 1997, pp. 3625-3631. Nachrichten, Vol. 28, No. 1-2, 1965, pp. 1-43. 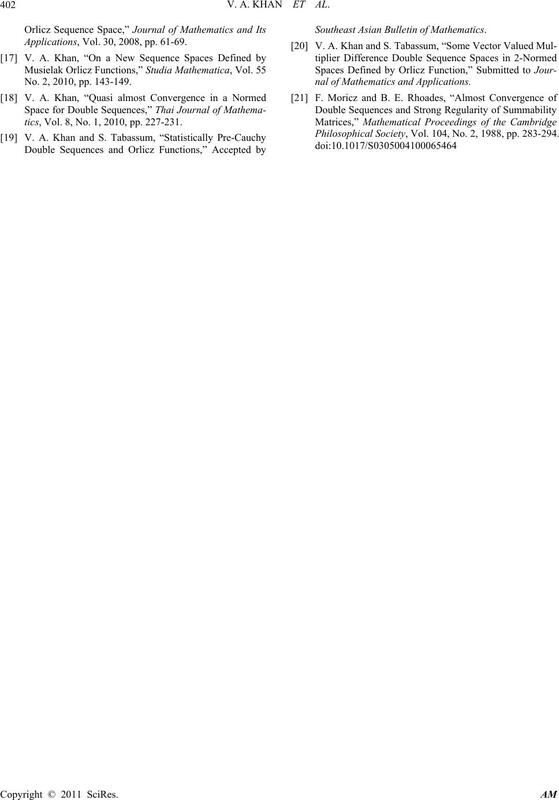 Normed Spaces,” Soochow Journal of Mathematics, Vol. 27, No. 3, 2001, pp. 631-639.
matics, Vol. 33, No. 2, 2009, pp. 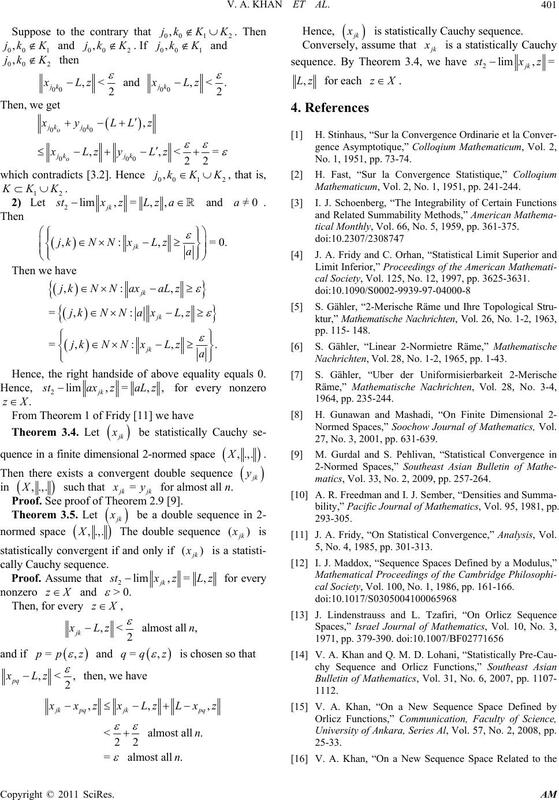 257-264.
bility,” Pacific Journal of Mathematics, Vol. 95, 1981, pp. J. A. Fridy, “On Statistical Convergence,” Analysis, Vol. 5, No. 4, 1985, pp. 301-313.
cal Society, Vol. 100, No. 1, 1986, pp. 161-166. University of Ankara, Series Al, Vol. 57, No. 2, 2008, pp. Applications, Vol. 30, 2008, pp. 61-69. No. 2, 2010, pp. 143-149.
tics, Vol. 8, No. 1, 2010, pp. 227-231. Southeast Asian Bulletin of Mathema tics. nal of Mathematics and Applications. Philosophical Society, Vol. 104, No. 2, 1988, pp. 283-294.